In Biblical times, what was a land “flowing with milk and honey” given that that land was very hot and they had no fridges to store the milk? It sounds pretty smelly to me. For thousands of years before the invention of pasteurisation and refrigeration, nomadic peoples had found ways of storing dairy in a hot climate and while moving from place to place. Among cultures such as the Masai and the sheperds of the Caucasus, these techniques are still the only way to keep milk. For such people, the word “milk” never means the homogenised cold white stuff we love to quaff by the glass and pour on our cornflakes. Rather, it is some sort of sour, fermented derivative that is nutritionally enhanced and partially digested by the bacteria it contains. 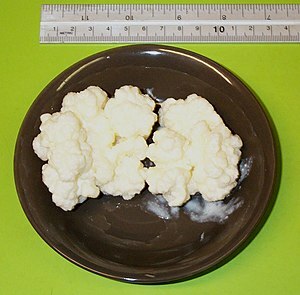 Culture complexes of yeasts and bacteria are used the world over to create kefir, yoghurts, and cottage cheeses – each region historically developed their own unique cultures. When added to the milk, these cultures go to work, in some ways speeding up the decaying process of milk but keeping it safe to drink. The growth of the “good” microorganisms is vigorous enough to repress the development of other harmful ones and often renders the environment too acidic and hostile for the “bad” bacteria. Many products now available in western supermarkets and marketed as health drinks with “friendly bacteria” or “probiotics” are simply derived from these traditional cultures and can easily be made at home. Kefir is a “grain” treasured by shepherds in the caucasus region and enjoying a resurgence among health food enthusiasts. The culture itself can be divided and passed on from one person to another, often taking on unique regional characteristics. Added to milk, kefir grains cause fermentation, acting on the sugars to produce acidic by products and alcohol. Kefir drinks can be made and kept at room temperature, varying in thickness and alcoholic content according to the specific culture and how it is treated. It is often mixed with salt or sugar to make a refreshing drink. Lacto-fermentation is also the process that results in yoghurt which can also be made on the windowsill in a warm climate but using a different starter culture that usually includes Lactobacillus bulgaricus and Streptococcus thermophilus. The Maasai people of Africa are one of the oldest pastoral cutures on the planet and their entire life revolves around their cattle who provide milk and blood and, only very occasiaonally, meat. In spite of consuming more fat than would be healthy for a westerner, cardiovascular disorders are virtually unheard of. For the Maasai, the primary way of storing milk is in the cow. A Maasai is never far from the source so can just squeeze out some raw milk and drink it on the spot, sometimes mixed with blood. To preserve it, milk is kept in hollowed out gourds that are blackened inside with smoke that may go some way to keeping the contents. The milk is then allowed to curdle and is still different to the foul smelling lumpy stuff we get if we leave the milk bottle out, by virtue of it having a rich complex of microorganisms in it to begin with. I have spoken to people who have had the dubious pleasure of drinking this stuff and by all accounts it is not to everyone’s taste, although highly nutritious and prized by the people themselves. In the pantries of old victorian houses it is still possible to find a huge slab of slate on which dairy would have been stored. In temperate climates, the cooling properties of slate were sufficient to keep cheeses and milk at a low temperature for every bit as long as in our modern refrigerators. The victorians also made use of terracotta pots that had been soaked in water. As the water evaporated off from the porous material it would carry heat away, keeping the contents cool. A “pot-in-a-pot” fridge is simple to construct using unglazed terracotta pots and sand, and this technique has been used in arabic countries for hundreds of years to preserve vegetables and dairy products. The Arabs call this type of refrigerator a “Zeer” pot. Given that the refrigerator is only an invention of the last sixty years in human history and that it consumes up to 20% of our household’s energy, we could do well to learn how to live without it for the sake of the planet and discover a range of new tastes and techniques in the process. Should I live Without a Fridge?